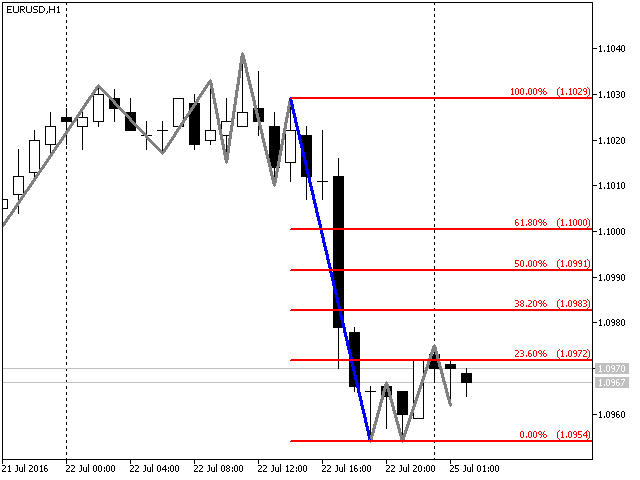 The Simple ZZ Fibo indicator represents a further development of the ideas about automatic price pattern identification, implemented in the Simple ZigZag and Simple ZZ Color Retracement indicators. The Simple ZZ Color Retracement indicator is based on the Simple ZigZag indicator - the significantly simplified and more efficient version of the well-known ZigZag indicator, that finds local Highs and Lows on the chart. Just like the Simple ZZ Color Retracement, the Simple ZZ Fibo indicator measures the length of the recent ZigZag wave and compares it with the moving average length of the N latest waves. If the length of the recent wave is K% greater than the average wave length, the indicator plots a Fibonacci grid on the basis of this wave. The prices corresponding to the plotted grid level are stored by the indicator in specially reserved seven buffers (2-8). 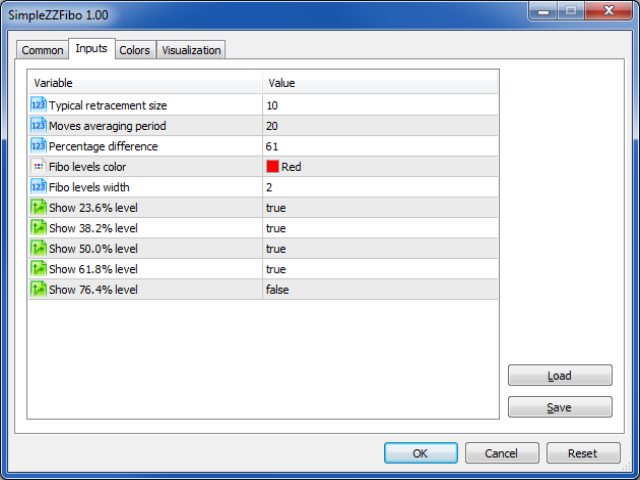 The number of ZigZag waves used for calculation of the average movement, the level of impulse exceeding the average wave length, the number of used levels are selected by the user in the indicator settings. Typical retracement size - depth of the typical retracement - determines the "resolution" of the ZigZag, the smaller the depth of the typical retracement, the lower vibrations are "seen" by the ZigZag. Moves averaging period - The number of ZigZag waves used in the calculation of the average movement. Percentage difference - The percentage by which the impulse must exceed the average length of the ZigZag wave. Fibo levels color - Color of the Fibonacci grid levels. Fibo levels width - Line width of the Fibonacci grid levels. Show 23.6% level - Toggle displaying the level. Show 38.2% level - Toggle displaying the level. Show 50.0% level - Toggle displaying the level. Show 61.8% level - Toggle displaying the level. Show 76.4% level - Toggle displaying the level.